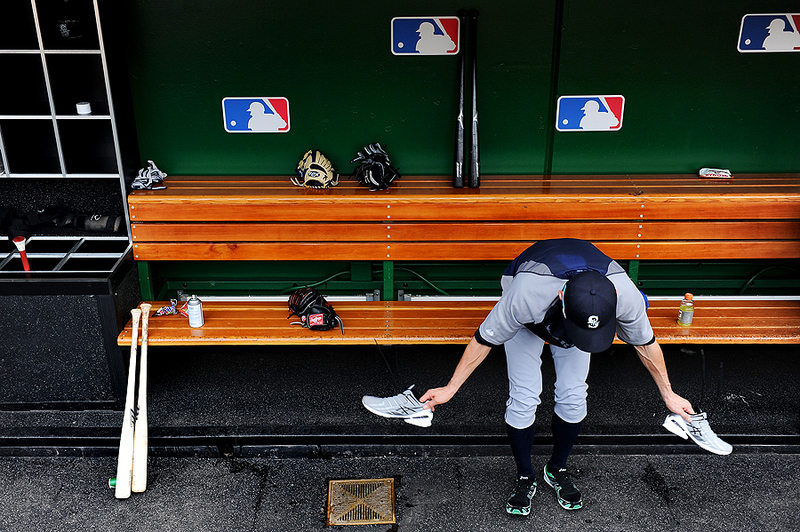 "Ichiro Suzuki #51 of the Seattle Mariners changes into his field shoes during warmups before taking on the Washington Nationals at Nationals Park on June 21, 2011 in Washington, DC." Not being an avid Major League Baseball fan, I have to do some homework before the games. In this case, other photographers made me aware of the Japanese all-star Ichiro Suzuki. I also got a friendly "konichiwa" in jest from some Nationals employees as I took to the field during batting practice. I knew then there was also an abundance of Japanese media. As batting practice and warmups commenced, I found myself photographing Ichiro. I overheard someone say he has a strict routine, so I thought some of the things he did may make some nice pictures, much like the above as he changes his shoes (which he does multiple times before the first pitch). The only problem was that there were some technical issues as I moved pictures through the night, so this picture and a couple other telling favorites never made it up live. They all had to be sent second non-live edit. It happens - All you can do is go out an make better pictures the next day.